When it comes to jewelry, especially necklace, you would definitely want to make something out of the box and unique. 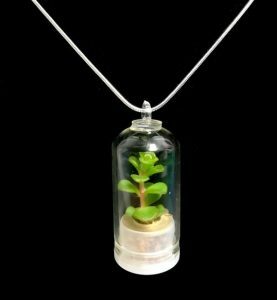 A necklace made using a terrarium or a transparent container used for growing plants would certainly be an apt choice for you. 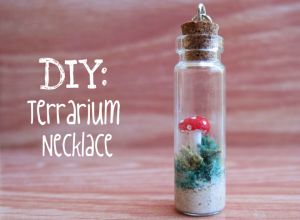 Check out the tutorials to get ideas of a host of interesting designs and patterns for making a necklace using terrarium. These mini terrarium necklaces would be an absolute pick to give away as gifts during Christmas. 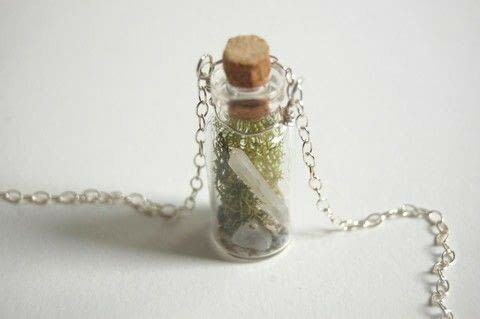 Make sure to mist the moss well with water to get rid of the darkness. 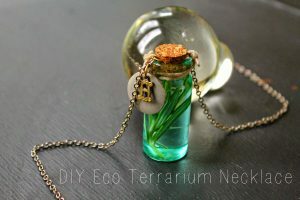 If you do not desire to stuff the bottle with anything, then an empty terrarium necklace like this one would be fine. Write the name of the recipient on the glass for a personalized touch. 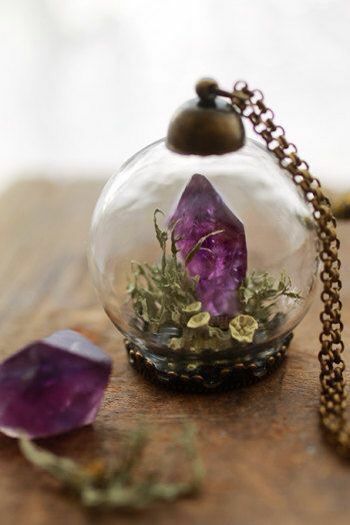 Stuff in many small pebbles and arrange them one after the other for a chic look. 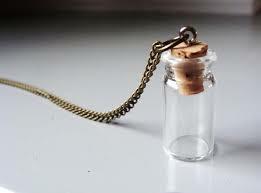 Consider choosing a teardrop-shaped bottle for a uniqe effect. The ideas to make a pendant as shown in the image below would be obtained from the link above. 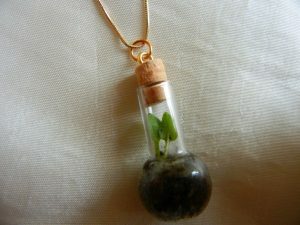 However, the only difference lies in the choice of glass charm, which here is in the shape of a bulb. 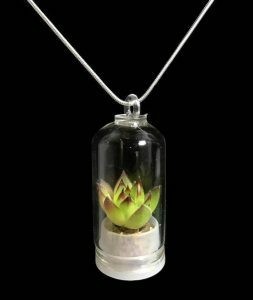 In fact, if you have a miniature light bulb at home, you may put it to use by designing a cute terrarium necklace out of the same. 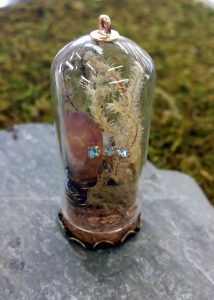 You could even add fern and other small objects as shown in the picture below. 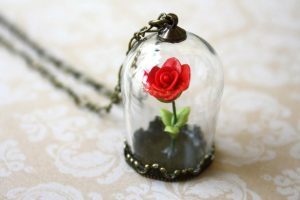 On the occasion of Valentine’s Day, a faux rose with a personalized message attached may be placed within the container. 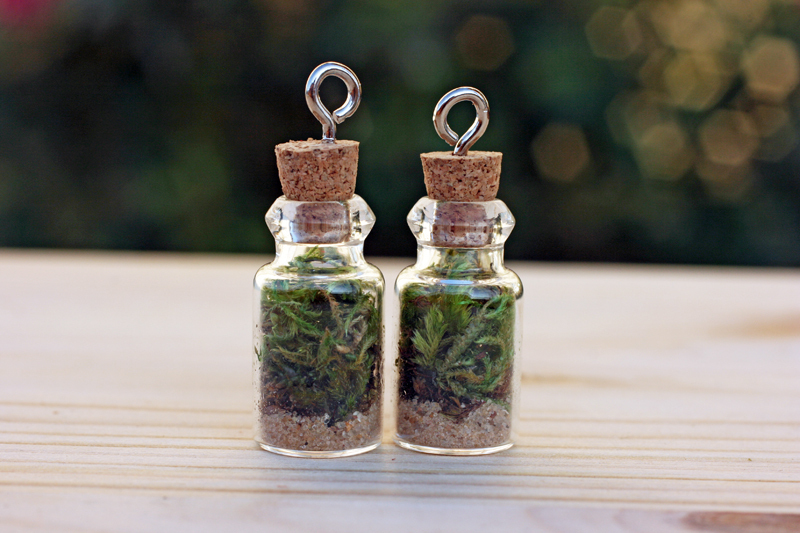 For a beach-themed wedding, these cute pendants would be perfect. 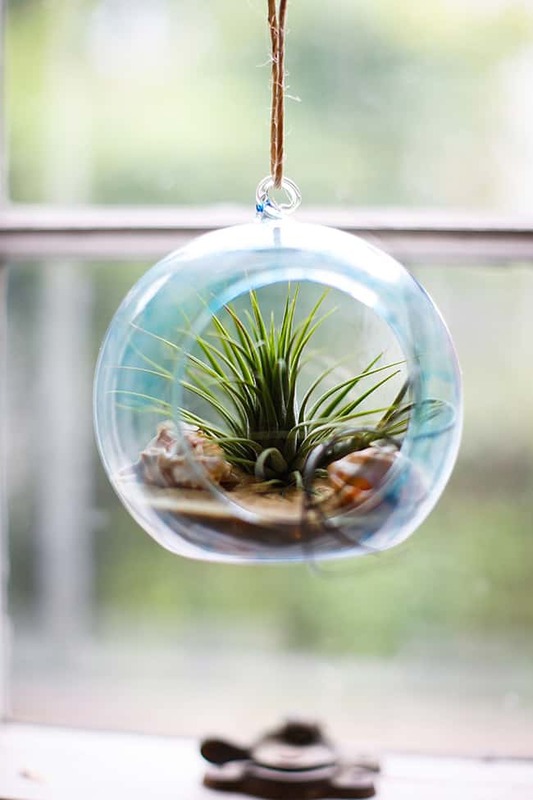 Add pearls and small shells to get the beach feel. 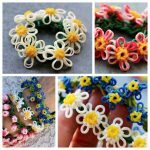 For any special occasions precious stones like ruby, emerald or pearls could be used. Small faux flowers at the base would indeed intensify the beauty of the necklace. If Christmas is the theme then artificial fern trees would replace the cactus. Instead of pebbles and stones as seen in most terrarium necklaces, tiny bells and balls may be put alongside the fern tree for a festive feel. For an aquatic themed necklace lotus or other water plants or artificial fishes need to be stuffed into the tube. 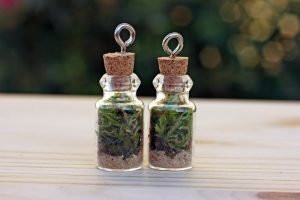 Addition of essential oils would help you spread the fragrance as you move around. Rather than discarding your test tubes which you had used for some of your projects, up cycle them to make these pretty necklaces. 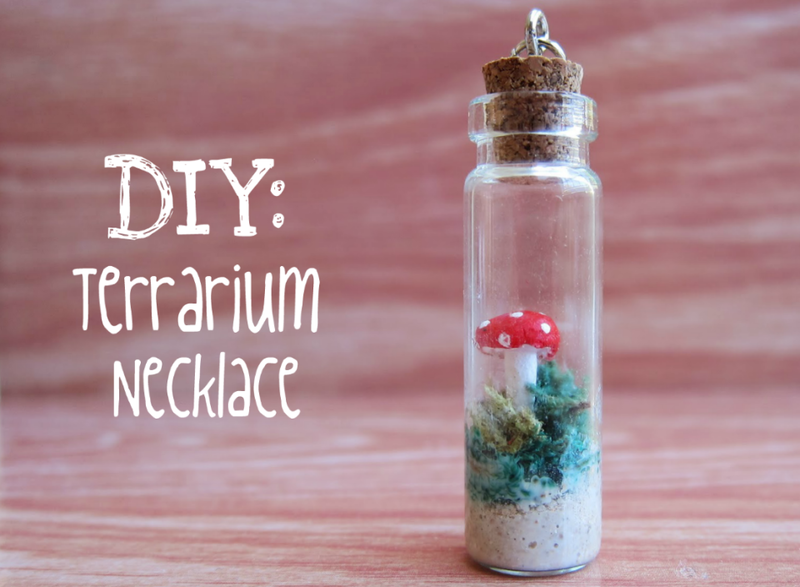 A cute fairy garden necklace using mini tubes may serve as your kiddo’s good luck charm. 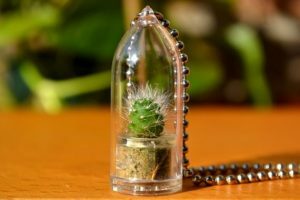 Apart from the pebbles, moss or rocks which a terrarium majorly comprises of, you could even go for a whole lot of things to stuff the glass tube or charms depending on the occasion you are making it for. In fact, confetti, glitters and sparkles of pink or blue would be apt for a baby shower, black glitters and a skull’s head perfectly suits a Halloween party, while a toy puppy within would be apt in case you are gifting it to someone who is a dog lover. 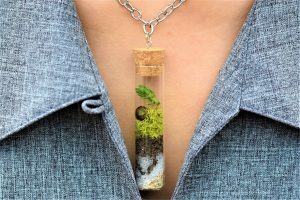 You could also make a full set by designing a terrarium earring and finger ring.